Who is the old lady that wants to play chess over the phone? How should one interpret the whispers on Jonas Berglund’s tape recorder? Is the three thousand year old Egyptian grave statue still around – and if so, where? Does the peculiar blue flower have a life of its own? What influences the course of history? Happenstance, will or – something else? In the summer, Swedish radio (SR) make radio adaptations of books for young adults and broadcast them in 15-minute episodes every morning (repeated in the afternoon). 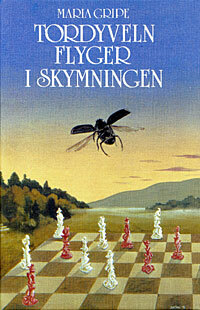 One of the “radio theatres” that has been so popular it’s been repeated a number of times is Tordyveln flyger i skymningen; which translates as “the dor-beetle flies in the twilight” which sounds mysterious and a lot less clunky in Swedish. It was thought up by Maria Gripe and Kay Pollack, and actually, the radio theatre wasn’t an adaptation of a book – the book is an adaptation of the radio theatre – which I didn’t know until recently. The story itself is about three young adults in Ringaryd, a small village in Småland province in the south-east of Sweden. They’re called Jonas (13), Annika (15) and David (16). Jonas and Annika are siblings and David is a friend of theirs. On his 13th birthday, journalist wannabe Jonas gets a portable tape recorder, which he is quick to go out and start using. He records lots of different sounds everywhere he can, such as the slightly delayed train. They also stumble across a mystery – a coughing man in a row boat, who has come to pick up a parcel from the lady at the local guesthouse. By a stroke of luck, the lady in question is going away and is looking for someone to come water the houseplants. Annika – eagerly cheered on by her brother – says she’ll do it. Things start happening – mysterious voices recorded on tape lead them to finding a box full of letters from the 18th century, written by one of the world famous botanist Carl von Linné‘s apprentices … and they speak not only of a great, tragic love story, but of an ancient statue, taken from an Egyptian tomb. Is the statue still around, and if so, where is it? Jonas has a mystery to solve, while David is fascinated with the very modern thoughts that Andreas expresses in the letters and Annika is interested in the love story between Andreas and Emelie, who was the recipient of the letters. Growing up, I heard the radio theatre and followed it with interest. As we had the book at home, I read it as well. Several times. A few years ago, I asked for my parents to bring it over when they came to visit, and read it again. To my surprise, I recognised so much that would be considered “right up my alley” – could it be that this novel influenced me? The most recent re-read had be a bit bugged at how it was actually written – very simplistic, you could say – but the story is still there, and it’s the story that has me hooked. Andreas’s thoughts, which were considered “too out there” for the 18th century, and possibly also in 1978 (really?) but now … Pick up any New Age style book and you’ll see something different. In fact, I think a few quantum physics books also go into things like how everything is connected, and that plants have feelings (or at least that they emit very low-level electrical impulses which can be measured), and so on. It also ows a lot to Carl Jung and the theory of synchronicity (“everything happens for a reason”), and then it talks about electronic voice phenomena (EVP), but in a much more accurate and believable way than, oh, White Noise. As a story of three teenagers unravelling a centuries old mystery in their summer holiday, and with charming characters as the vicar, not to mention Jonas’s salty liquorice obsession (♥) … it’s a great story, for young and old. The mysterious lady who calls up to play chess with David over the phone I’m sure inspired a very peculiar dream I had once, but which I can’t go into here because it would be a HUGE spoiler. I’ve tried to see if this book has been translated into English, but apparently it hasn’t. You’re losing out, non-Swedish people; seriously. It’s a great story well told, which is unsurprising, considering Gripe is a famous author of novels for children and young adults, of which I’ve read a handful or so. Would love to see it translated into English or even adapted as a film back home. 4.8 out of 5 scarab beetles. The only reason I can’t give it 5 is because the simplistic way it was written annoyed me too much. You who sit with this book in your hand. Have you thought about something? to read this particular book at this particular time? Was it just a coincidence, a fluke? 2 Responses to "Tordyveln flyger i skymningen by Maria Gripe (1978)"
I’ve read this so many times over the years and it’s always been a favourite. Actually I remember prefering “Tordyveln” to “Agnes Cecilia”, which is also considered to be among Gripe’s best work. Your review brought up some nice memories, thank you 🙂 It’s been a number of years since last time, so perhaps it’s time for a re-read!